Our partners at the Oxfordshire Mental Health partnership have had an award-winning month. 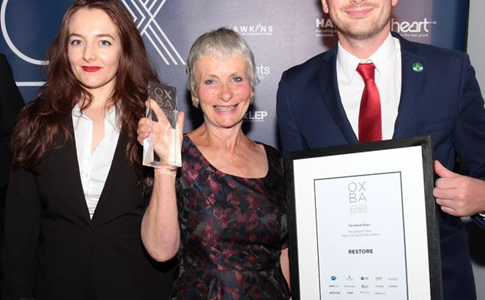 Our partners in the Oxfordshire Mental Health Partnership (OMHP) have been winning awards over the last month: Wendy Lynch, a long-standing volunteer at Oxfordshire Mind, won an award at the OCVA charity awards. Wendy has volunteered at the Oxfordshire Mind Witney hub for six years, helping to set up the ‘Get into Reading’ peer support group, to encourage service users to read and explore stories to promote positive mental wellbeing. Volunteers play an important role both within the Oxfordshire Mental Health Partnership and at Oxford Health: find out more about volunteering at the partnership and at Oxford Health. Find out more about the Oxfordshire Mental Health Partnership.